What the history of Mexican anti-Americanism can tell us about the Trump era. There’s a long tradition of anti-Americanism in Mexican politics. It’s making a comeback in the era of Trump. 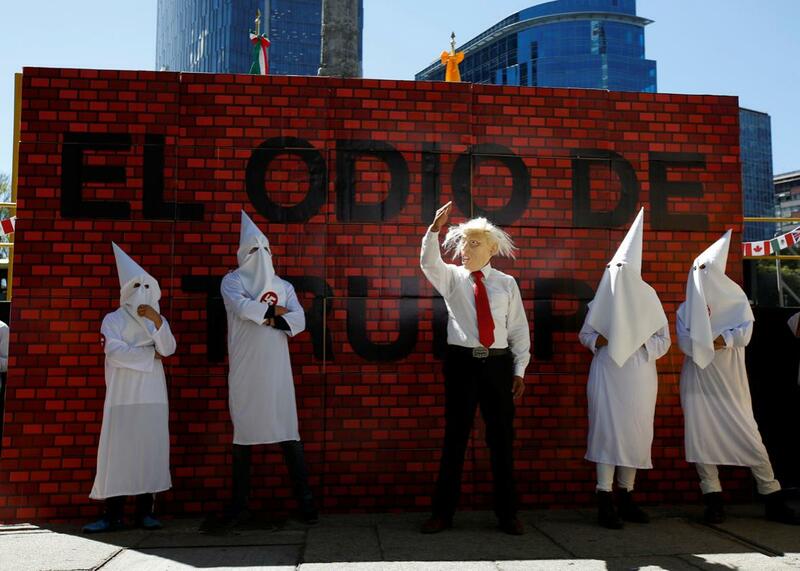 Actors impersonating Trump and KKK members stage a performance on behalf of a local Mexican political party during a protest against Trump, in Mexico City on Feb. 20. When Mexican President Enrique Peña Nieto opened gasoline prices to market forces this January, the resulting 20-percent hike—both a step toward the entry of foreign gas stations and a top-up for the treasury’s depleted coffers—prompted weeks of outrage. 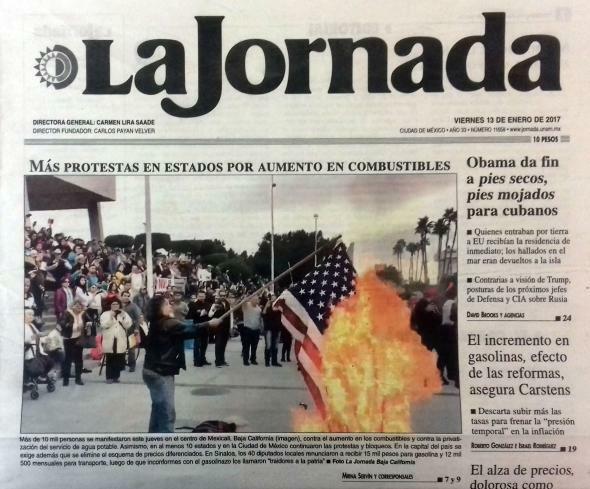 La Jornada, the country’s leading left-wing daily, reported on the protests one day by splashing its front page with a woman setting fire to Old Glory. The message: The gas hike is the fault of the gringos. The paper’s take was a deeply oversimplified reading of the situation, but it makes sense in the context of what I call gringophobia, a strain of Mexican nationalism—at times muted, at other times pronounced—that views the United States and its citizens as objects of fear, disdain, and blame for the country’s ills. La Jornada, Mexico’s leading left-wing daily, has long made anti-Americanism an article of faith—and a selling point—as shown in its front page from Jan. 13. Mexico today is ripe for overt gringophobia, and two singular forces are making it so. One is Donald J. Trump. Since his campaign-igniting “murderers and rapists” speech of 2015, Trump has had no rivals as the American whom Mexicans most love to hate. U.S. media often play up the lighter side of this loathing: old folks bashing yellow-headed piñatas, narcos catapulting bales of marijuana over the border wall Trump has promised to extend. In Mexico, the mirth has fizzled. Between Trump’s nomination and inauguration, the peso lost a fifth of its value. Cowing before the president-elect, Ford canceled a planned plant in Mexico. The economy is anemic, and with Trump’s insistence on tearing up (or at least toning down) NAFTA, prospects look uncertain. The other force is Andrés Manuel López Obrador, a former mayor of Mexico City and a nationalist-populist stalwart of the left, tagged by the late academic George Grayson as a Mexican messiah. Known to disciples, detractors, and neutrals alike by his initials, AMLO, López Obrador made his first bid for president in 2006 and lost by less than 1 percentage point. Part of his allure owed to his opposition to U.S. influence. The Iraq war had made George W. Bush deeply unpopular to Mexicans, for whom foreign invasions, understandably, are a no-no. On the campaign trail, the then–52-year old AMLO boasted he spoke no English and had never set foot in the USA. In 2012, his second-place finish was more distant, thanks chiefly to massive support for Peña Nieto from the TV behemoth Televisa, but it did not help that he no longer had an internationally toxic U.S. president to make noises about. In 2018, Mexicans will vote again, and for most of the past year López Obrador has been polling as the front-runner. Political observers tend to agree that the greatest beneficiary of Trump’s election, by far, is AMLO. AMLO’s anti-Americanism is not new. Time and again in Mexican history, gringophobia has been utilized for political gain. The trope originated in the 1820s—Mexico’s debut decade as a republic, when U.S. Ambassador Joel Poinsett meddled in politics in favor of local liberals. It mushroomed in the 1840s with the Mexican–American War, known in Mexico as the U.S. Intervention, which ended with the loss of half of Mexico’s territory. The war and the massive land-grab that it engineered angered all elites, but especially the conservatives. Conservatives lost the upper hand in the 1860s, thanks to a fateful alliance with a French-imposed emperor, and the ensuing Age of Liberalism witnessed a U.S.–led building of railroads and revival of mines. The rich whined about an invading “swarm of ants” that brandished revolvers and frequented barrooms, and they satirized the rudeness of the Yankee workers with whom they sometimes had to share train compartments. But outside the contact zones of mining camps and oil fields, resentment was limited to rarified circles. All that changed after 1910, when Mexico was plunged into a decadelong revolution that produced what was arguably the world’s first socialist constitution. It was now the left, much more than the right, that waved the banner of national sovereignty. And gringophobia evolved too, entering popular culture on a massive scale. Political cartoonists drew American investors with large girths, sneering smiles, and outsized diamond rings. A literary excoriation of Yankee business activity proliferated, as it did throughout Latin America; unlike ordinary Americans, whom novelists often absolved, investors were stereotyped as cold, racist, immoral, sometimes lustful. A nascent film industry started to depict the exploitative U.S. businessman as a stock character. 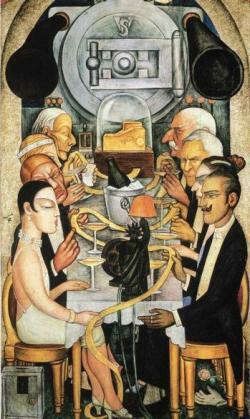 U.S. investors John D. Rockefeller (top left), J.P. Morgan Jr. (top right), and Henry Ford (second right) dine on ticker tape in a Diego Rivera mural from 1927. Mexico’s new rulers needed a useful bugaboo, for their biggest concern in the 1920s and ’30s was holding the state together. The 10-year revolution was followed by a series of lesser rebellions that threatened to topple the government. Perennially short of cash, the state had limited options, but one thing it could easily do—to satisfy the constitution’s radical promises and to strengthen its tenuous hold—was to seize U.S. assets. Per one estimate, foreigners—mostly Americans—had come to own 27 percent of Mexico’s surface area by 1910. Expropriations became the order of the day, the land typically redistributed among the peasant and rancher majority. And the policy reached a populist climax in 1938, with the seizure of the U.S.– and U.K.–owned oil companies. The president who made that jackpot-hitting call, Lázaro Cárdenas, remains the most popular figure in 20th-century Mexican history. The PRI, which ruled uninterrupted from 1929 until 2000, was a very broad church. Its left wing grew ever unhappier with the turn their “revolution” was taking. Matters came to a head in 1959, when Fidel Castro’s rebels rode into Havana and started imposing a state-directed economy. Leftists hailed the Cuban model as a reminder of abandoned ideals. Growing U.S. hostility to Castro only bolstered their case. Seeking to fix their ire on a symbol of all that had gone wrong, in order to sway both the PRI and the public toward a re-embrace of socialism, many writers and politicians opted for one William O. Jenkins. A native of Tennessee, Jenkins had moved to Mexico in 1901 and made successive fortunes in textiles, property trading, sugar, banking, and the film industry. He had done so through a complex mix of entrepreneurial savvy and befriending the powerful, chiefly among the right wing of the PRI. In 1960, Time would call him the richest man in Mexico. As the Cuban Revolution of 1959 inflamed the passions of Mexican leftists, U.S. expatriate industrialist William Jenkins met with a barrage of anti-American rhetoric. While some of the attacks against Jenkins were accurate, others were exaggerated, still others fabricated. Even the truths were often distortions of a sort, as they tended to ignore how Jenkins’ busting of unions, arming of vigilantes, evading of taxes, monopolistic bullying of rivals, and backing of autocratic politicians was standard practice among Mexico’s business elite. Jenkins had become one of them, for he never returned to the United States and did not repatriate profits, but he took more flak because he was a gringo. The battle for the soul of the PRI was won by the right. Continuity triumphed when the president, following ruling-party practice, hand-picked a conservative authoritarian as his successor. But Jenkins’ vilification mattered: It contributed to an ever-more-shrill rhetorical struggle, echoed in the streets with student marches; chants of “Cuba sí, Yanquis no!”; and occasional killings. The battle polarized Mexico for years and inexorably arrived at a bloody outcome in October 1968. Ten days before the Mexico City Olympics, the army halted a growing protest movement by killing dozens, perhaps hundreds, of students. 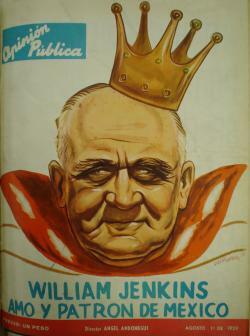 Jenkins was often criticized as a monopolist. This 1953 cartoon shows him strangling Mexico’s film industry, since he favored Hollywood fare at his dominant chain of movie theaters. For more than two decades now, Mexico and the United States have drawn generally closer. NAFTA played a huge part, though not entirely as its neoliberal architects intended. Its mid-1990s opening of Mexico to subsidized U.S. maize prompted several million peasants and their families, no longer able to sell the surplus from their cornfields, to migrate north. In turn, years of back-and-forth movement by these migrants have tempered old prejudices about Uncle Sam. Millions of Mexicans have now seen him for themselves. But two key factors keep gringophobia in play. First, believing the worst of the United States remains an article of faith within some sectors of society, such as many faculty in the social sciences at the big public universities, along with media such as La Jornada and the popular, combative newsweekly Proceso. In August 2014, when Peña Nieto’s investment-enticing energy reform became law, the front-cover verdict of Proceso was simple: “The Hand Over”—that is (so its lead article made clear), of Mexico’s oil to the gringos. Second, national opinion remains subject to huge mood swings. In 2003, following Bush’s invasion of Iraq, pollsters Latinobarómetro found that just 41 percent of Mexicans had a positive view of the United States, while 58 percent held a negative view. Thirteen years later, during Obama’s final year, only 15 percent expressed a negative view, while 76 percent had a positive one. Such polls suggest that a major determinant of Mexican opinion is the occupant of the White House. Moreover, not counting don’t-knows, Latinobarómetro last year found that just 12 percent of Mexicans held a negative opinion of Obama; 94 percent disliked Trump. With Trump in the Oval Office, Mexico may never have been as fertile a field for politicized gringophobia as it is today. The land conquered by Gen. Winfield Scott in 1847 was less a nation than a map of ill-connected states, much of its populace likely oblivious of the invasion until well after it had happened. When the U.S. Marines took Veracruz in 1914, news still reached only a minority, for 85 percent of Mexicans remained illiterate. Republican presidents are a favorite target of La Jornada. 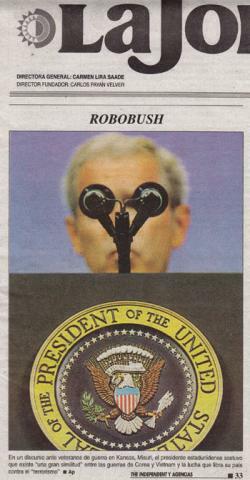 This cover image of Aug. 7, 2007, adds an editorializing title to an image of Bush giving a spech on the war on terror. His frequently firebrand oratory, which sometimes recalls Venezuela’s Hugo Chávez, is a great part of the attraction to many AMLO devotees. He likes to refer to the PRI and the PAN as the “mafia of power.” Policy-wise, however, López Obrador currently seems keener to follow the more moderate path of Latin America’s other leading leftist of the new century, former Brazilian President Luiz Inacio “Lula” da Silva. In February AMLO enlisted several prominent businessmen to his circle of advisers. Yet as the July 2018 election draws closer, tightness or slippage in the polls may prompt López Obrador to revive some of the us-and-them rhetoric toward the United States he used in 2006. Past poll swings suggest there are votes in such language—perhaps not enough to lock an absolute majority, but enough to finesse the difference in a three-way race. And what then? Would a President AMLO succumb to the temptation—à la Venezuela’s Chávez and Nicolás Maduro—of blaming the United States whenever times are tough? Or would he rather, like Lula and his successor Dilma Rousseff, denounce opposition politicians at home? As long as Trump is in the White House, the easier option could well be the former.